Today's PC climate no longer encourages targeting the human form other than for military training, although caricature targets depicting such individuals as the Ayatollah and the Iraqi President have been seen in recent years. War has always seen such considerations as superfluous, as indicated by the large numbers produced in such times. 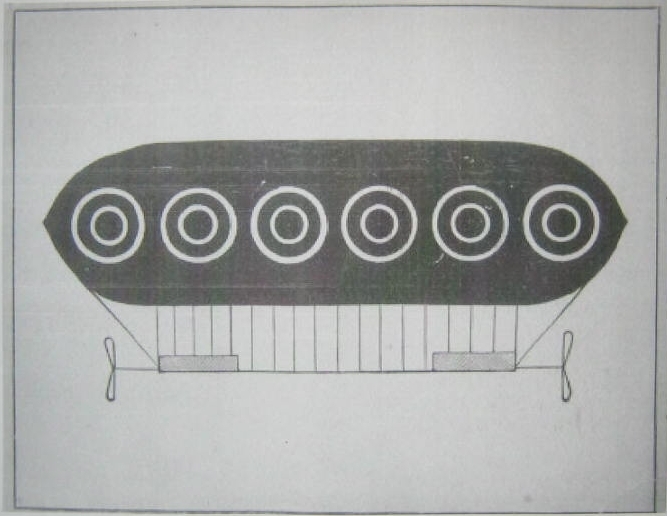 Below is a target of The Kaiser and his staff, produced for miniature rifle training. The scale is set at 400 yards for use at 25 yards. The head and torso scoring lines are just visible. 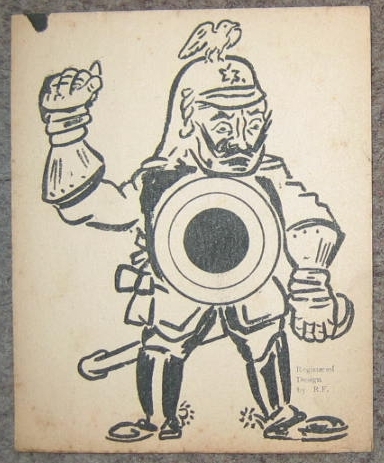 Both the above target , and that of the Kaiser on horseback below, are from the Large Practice series of the "True Life target Co." produced in 1914. Any marksman making the highest possible on each of the 5 figures in five consecutive shots, adds 10 extra to his total score." 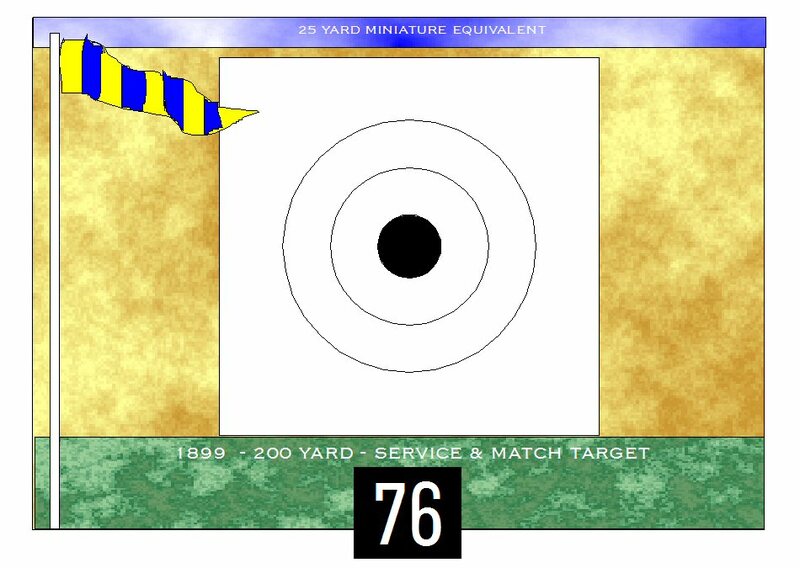 On the target below, an additional 3 points were available for a "Hit on Horse, possible injury to Rider"
A rather more serious early miniature range target is shown below left and, as it says, the representation of the kneeling "Hun" is of real-life proportion at 25 yards range for miniature calibre rifles. 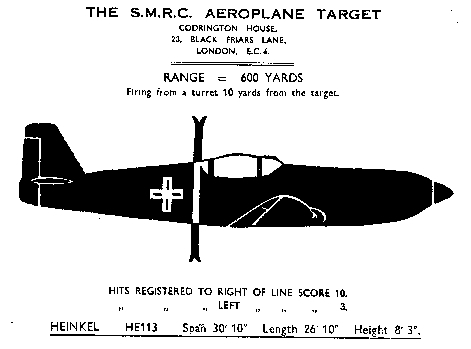 A similar target can be seen illustrated on the poster shown underneath. ( or the other way around). "True Life target Co. of Broadway, West Ealing, London. 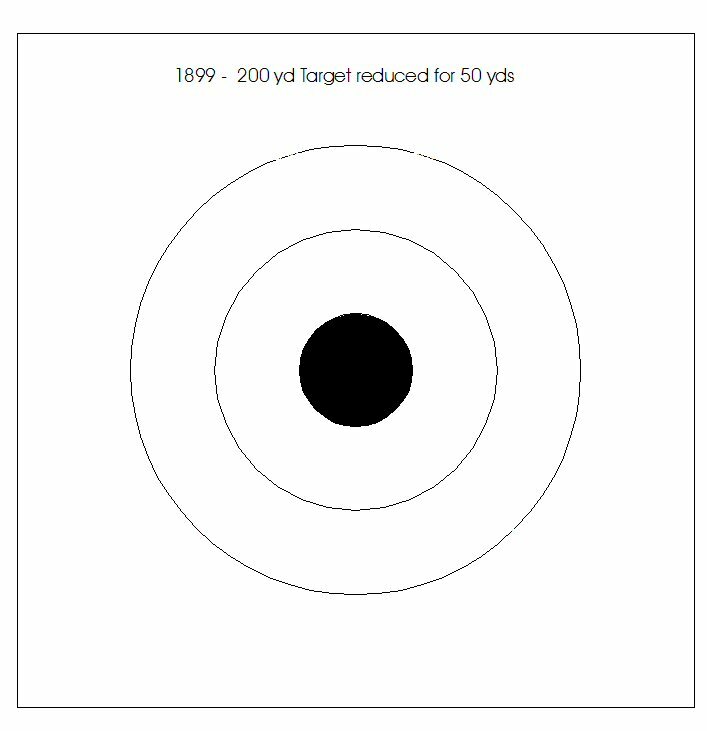 On offer were TARGETS represented at various ranges in the lower hundreds of yards.
" The Royal robber chief" and "The War Lords of Europe" - a fine challenge here to identify these latter characters! This Rifle Association was formerly the Society of Miniature Rifle Clubs ( the change was in November 1947). to encourage shooters of the day to prepare themselves for the possibility of military service. 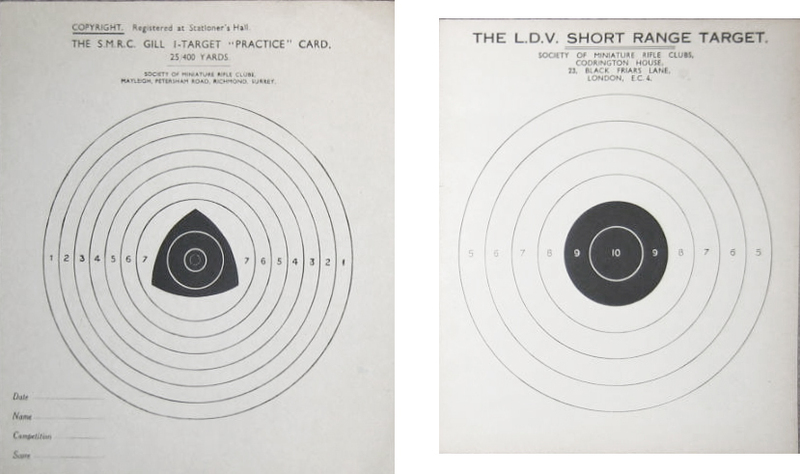 The NSRA TARGETS (shown first) are all post 1947 and the SMRC TARGETS prior to that date. Nowadays, the above target would not be considered "Cricket" in civilian circles. But the target below certainly is! and still available here in 1916 from the Society of Miniature Rifle Clubs by which time it was unsurprisingly necessary to reiterate the rules! 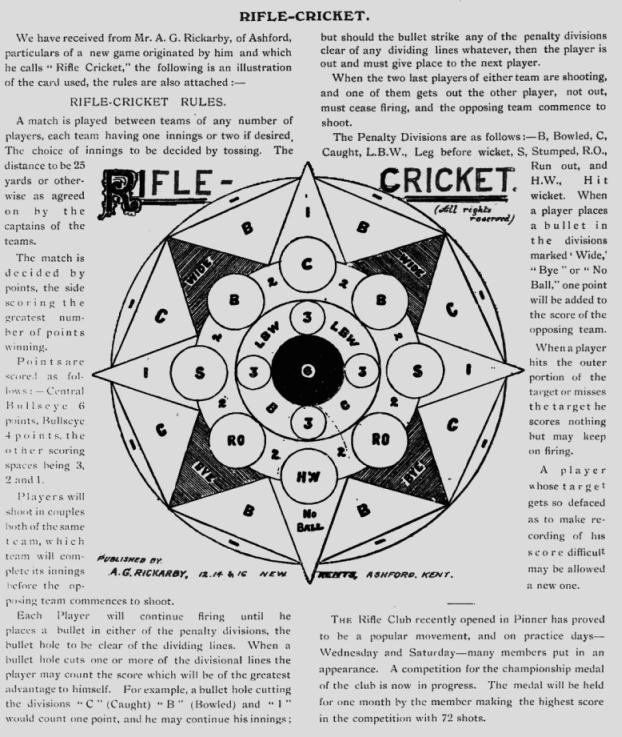 The rules were yet again published in the September 1919 "Rifleman" S.M.R.C. journal. For those who would like to try it, the following is the definitive procedure copied from that edition for use with the 1906 version of the target previously illustrated. 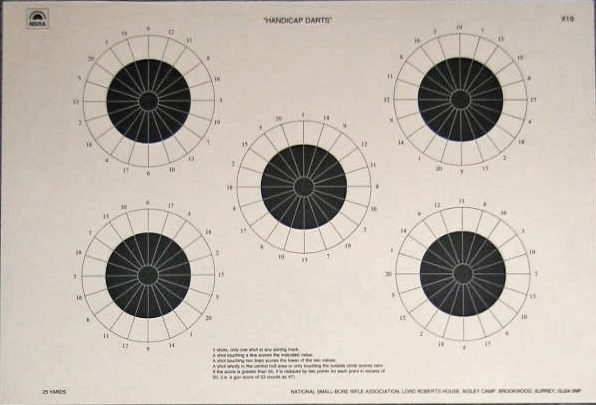 The diameter dimension of the target's outer circle, for use at 25 yards, is 3¾ inches. 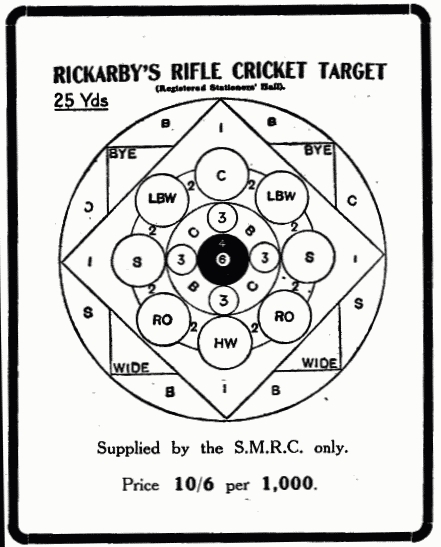 R IFLE Clubs desirous of a change in the way of competitions would do well to try some "Rifle Cricket" matches, using the target we reproduce below. The divisions on the target represent runs and penalties, and it would be as well to explain here that the penalties are as follows :-B., bowled ; C., caught ; S., stumped ; L.B.W., leg before wicket ; R.O., run out ; H.W., hit wicket. There are runs 1, 2 and 3 outside the black, a hit on the black counting 4 runs and a white centre scoring 6. A" bye " or a" wide " would count one to the opposing team when a match is fired. If a club consists mostly of beginners, edge-hitting is to be recommended, but for clubs that have been in existence some time centre scoring should determine the value of the shot-hole. Jones ~ 4-4-3-3-2-4 ~ caught. Total, 20. Jones, at his seventh shot, placed a bullet in the penalty division C. and retires, the next man (Brown) taking his place, and the two shooters carry on as before. When the first team completes its shoot or innings the opposing team goes in and endeavours to beat its rivals. If desired, one man of each team may go in shoulder to shoulder. No more than 10 shots should be allowed at any one target, and it is advisable for the captains to arrange that if in a few shots the target is so disfigured as to make the recording of the score difficult, a new target be substituted. Try a match of this description in your club, and you will be more than satisfied ; but don't forget you may get out first shot or you may be well set and keep in for 50 or more shots. You will find that you won't be able to afford to throw away anything, as if you miss the black, there is likely to be trouble in store for you. In the use of this target there is no possible, and if the other fellow puts up a big shoot you have an equal chance of beating him and setting up a fresh record. In edge-cutting you must remember that the shot-hole must be clear of any line, and if the firer places a shot in a penalty division he is out, and must give way to the next man. If the shot-hole cuts two or more divisions the competitor counts the highest value of the shot. When scoring by the centre of the shot-hole a competitor is out if the shot is more than half in the penalty division, and if the shot-hole cuts two or more divisions, the position of the largest part of the shot-hole decides the value of the hit. To score a 6 in the centre of the bull edge touching should always be the rule. Individual competitions may also be arranged with this target, or a limit of 10 shots per man only may be made, the competitor to cease fire if he comes out before he has shot his 10 rounds. The target is a good one to make a man careful, and beats that feeling which comes over every shooter at some time or another when he says to himself after he has been holding on too long, " Oh, let it go !" Similar TARGETS for games of shooting "Cricket" have been in use for many years. 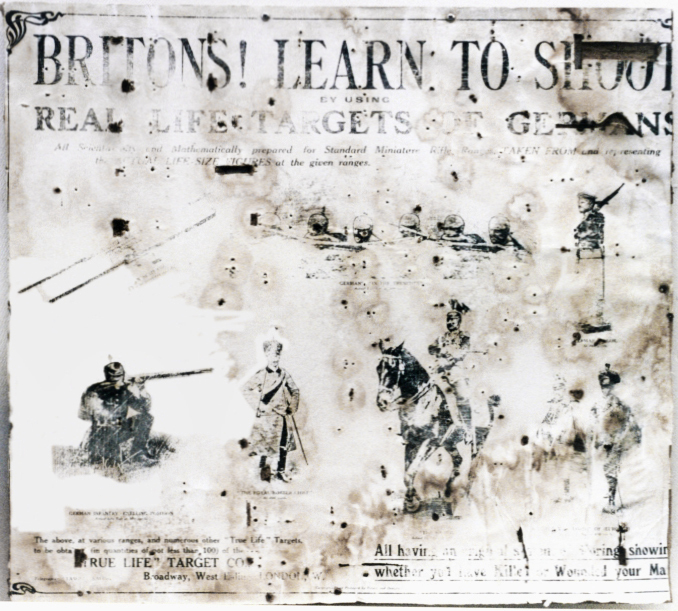 Below is a series of novelty TARGETS published Post-War by the National Small-bore Rifle Association of Great Britain, which was formed from the S.M.R.C. in 1947.. 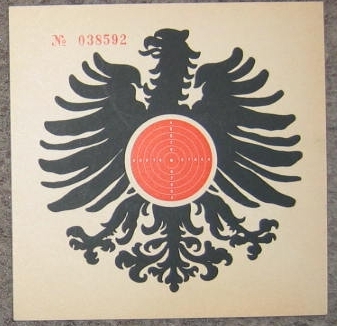 These were intended to add another element to the more familiar symmetrical standard TARGETS and, in some cases, an element of luck to perhaps permit the less accurate shots in a club to enjoy the occasional triumph over their higher flying colleagues. Such TARGETS could be a great leveller at Christmas time when club shooting can become, for a few days at least, rather more light -hearted! Above to the right is the LDV (Local Defence Volunteers) wartime target. 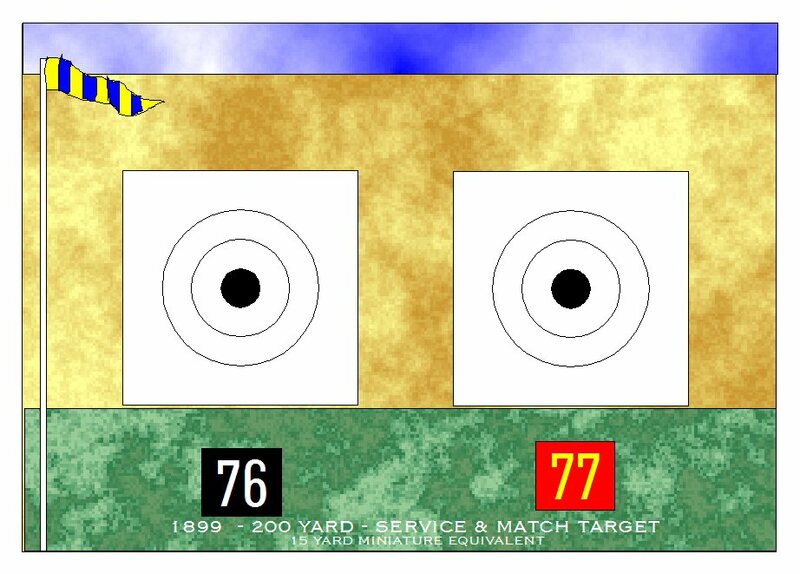 Below is a miniaturised version of the 1899 Military fullbore targets depicted at Bisley. These are designed for modern use on fifteen, twenty-five or fifty yard ranges, and for printing out "Landscape" on A4 paper. the twin target file for 15 yards range, or a single target file for 25 yards range, or the single target file for 50 yards range. We also offer a copy of the scorecard for the 1899 target (as used in the 1999 Centenary Match of the Colchester Rifle Club). The above four JPG  files are respectively, 113, 103, 34 and 132 kb each.